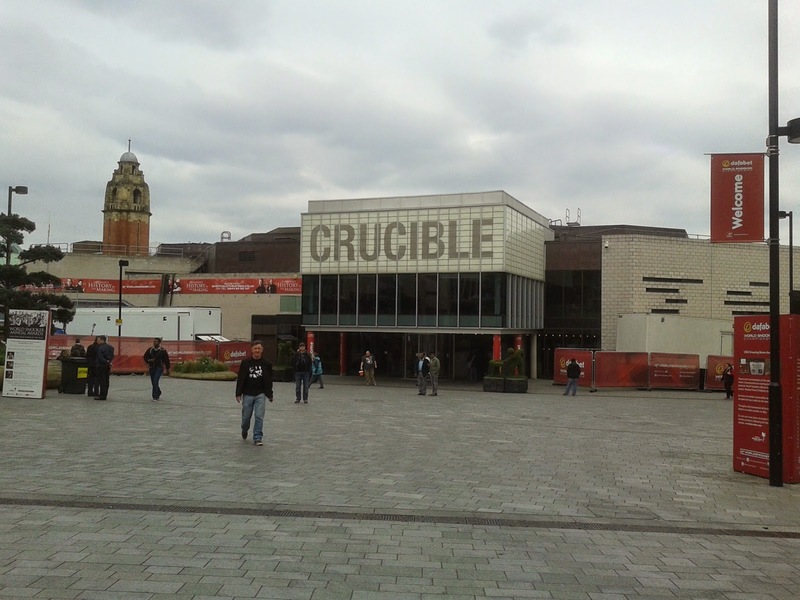 As part of my sporting Bucket-list, Box-ticking exercise, I had travelled down to The Crucible Theatre the previous year (2014) for the World Snooker Championships. 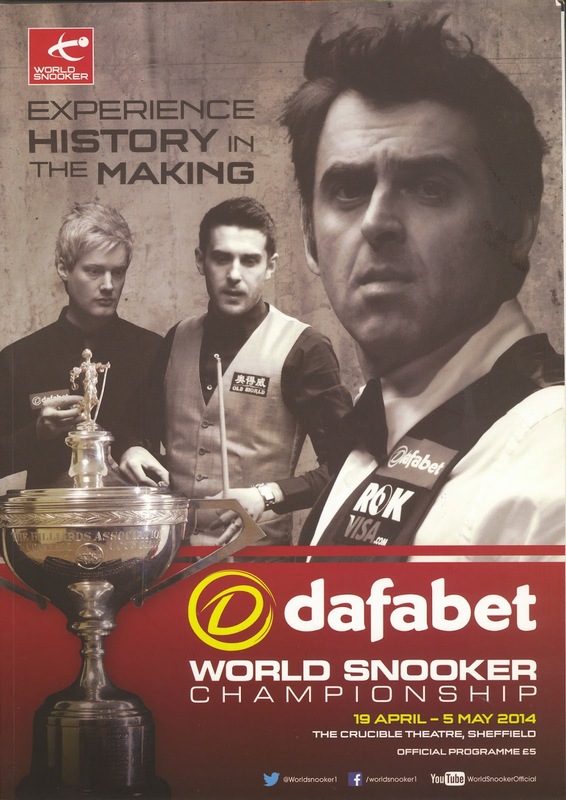 But it was just for a single session – the first of the final – where I watched Ronnie O’Sullivan open up a 5-3 lead over Mark Selby. Selby would of course triumph 18-14, having been 10-5 down at one point in the contest. The eight frames I had witnessed had appeared to simply fly past and, like most quickies I suppose, had left me feeling rather unsatisfied. Especially so given I knew was not going to be around for the climax of proceedings, so to speak. I decided a rather more fulfilling experience was required in 2015, so purchased tickets for all of the quarter-final sessions: six in total spread over two days. As these matches would be taking place during the two-table phase of the competition, I would only actually be able to see two of the last-eight ties, but that was fine. Previous winners - see 2015 version at foot of page. There are three things you notice upon attending the Crucible for the first time. 1. How small the place is. I know it only holds 900 or so folks, but it really is tiny. It is the precipitous nature of the seating which makes it such a special venue. 2. How cold it is inside. Certainly during the morning and afternoon sessions I attended it felt as if someone had left a rather important door open, resulting in an icy draught blowing through the place. I assume this was actually the consequence of a particularly efficient aircon system, and was perhaps intended to ensure a steady state environment. Are snooker ball/tables affected by temperature? I have no idea. 3. 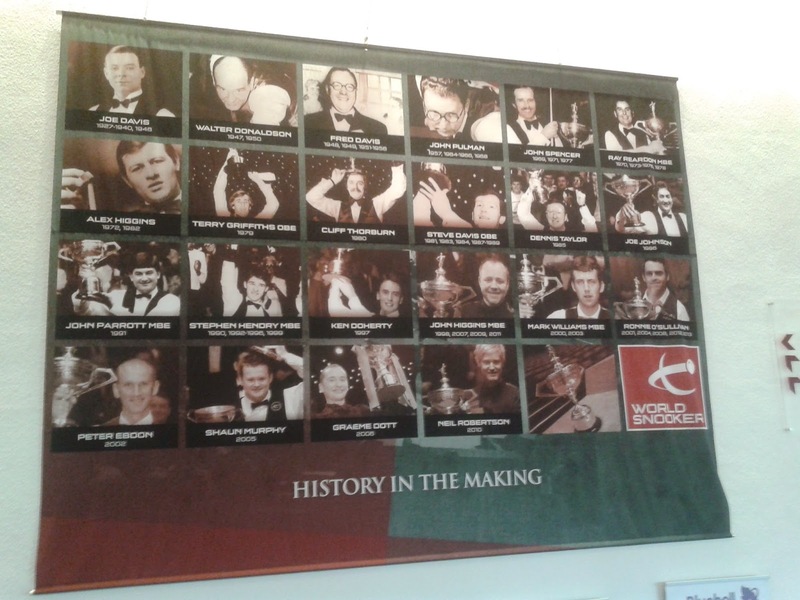 That the World Snooker Championships also double up as the World Coughing Championships. For it appeared as if everyone in the place was compelled to give it a go. And generally when one person plucked up the courage to break the silence, it invariably appeared to set off a clutch of others as the barking proceeded to travel around the hall, like some expectorating Mexican Wave. I found myself requiring to clear my throat on a number of occasions, but rationed my coughs to coincide with one of the regular bursts of applause. 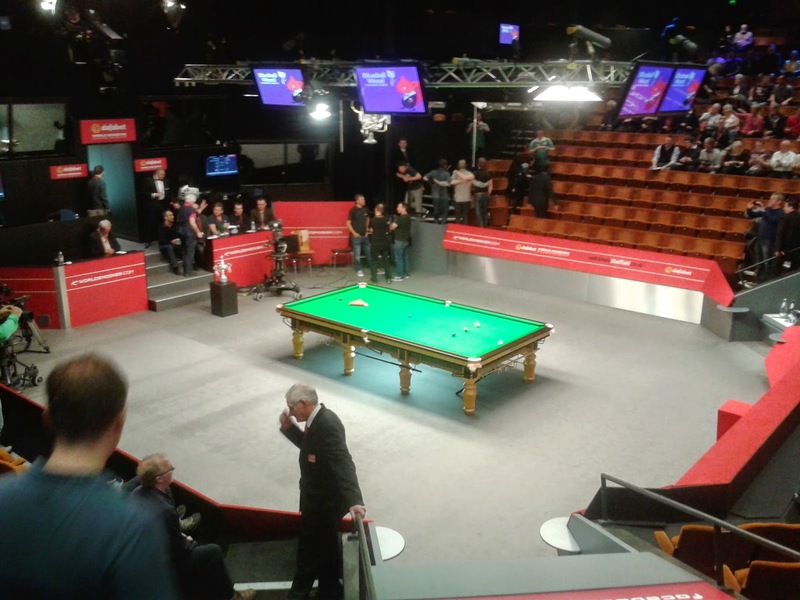 Earlier in the competition, I had watched on TV the wee smiling, ginger-haired Scots laddie Anthony McGill eliminate reigning champion Mark Selby, and I performed a little jig of delight when I noted one of the matches I would attend would be his last-eight tie against Shaun Murphy, who had taken the title himself back in 2005 as a baby-faced boy. Pink troubles plagued McGill in his first two frames, as Murphy swiftly racked up a brace of century breaks to move into a 2-0 lead. But McGill rallied, and the first session finished 4-4. The Scot (MIXED SPORTING METAPHOR ALERT) flew out of the traps at the start of the second session, taking the first frame with a 137 break, but toiled for most of the remaining frames against Murphy’s superior safety play. Murphy enjoyed a 9-7 lead at the start of the third session, and although McGill again took the first frame of the session in some style, the more experienced Englishman eventually prevailed, taking the next four frames to win 13-8. McGill’s exit forded me some time to go and poke around Sheffield so, as a sort of homage to one of the city’s sons Richard Hawley, I decided to go and visit Lady’s Bridge. But it was rather dull. Following the River Don I did come across a cryptic message (see pic below) daubed beneath another of the bridges across the river. It was one of those statements I felt was just so delightfully enigmatic, I did not (indeed, do not) want to know what it actually means. There was a continental food market on Fargate, and there I encountered Anthony McGill with his parents and aunt who had accompanied him down to Sheffield. On another day I may have stopped and offered my congratulations, but the four of them were all laughing and clearly having a great time, that I felt the introduction of a fat, balding, middle-aged man into their lives was not quite what they required at that point in time. The other quarter-final tie I had was between Australian Neil Robertson (whom I have always felt looks like a cross between John Inman and a Thunderbirds puppet – fortunately he plays like neither) and Barry Hawkins (who could pass for a bouncer in poor light). Things opened entertainingly enough in this one, with Robertson well on top and swiftly opening up a 3-1 lead. But after the mid-session break the Australian just appeared to go to pieces, unable to pot anything. He lost the next four frames without succeeding in scoring a single point. Both players upped the caution quotient in the second session on the Wednesday morning, reaching a climax with the grinding seventy-minute safety-fest that was frame fifteen. After sitting through six frames of increasingly tentative play from Robertson and Hawkins, I really needed a break (no pun intended), so decided to get a coffee and sit and watch a frame on the TV in the refreshment area. I had drunk my coffee and read most of a newspaper I had found, and yet still twenty-five minutes into play there appeared to have been only a couple of balls potted. Suddenly, I noted crowd activity on the screen – clearly the frame had ended I felt, and an opportunity to re-enter the arena had arrived. But when I retook my seat I was baffled to note there were still balls on the table. Apparently, the frame had gone on so long that Robertson’s bladder had reached bursting point, so he had had to disappear mid-frame. Upon his return, the Australian half-jokingly asked his opponent if he wished a re-rack, but play continued for a further three-quarters-of-an-hour of increasingly tactical safety shots by both players, before Hawkins finally took the frame 68-36 to take a 8-7 lead into the final session. This third session produced snooker of the highest quality, and featured one of those late night last frame Crucible finishes I have enjoyed so often on TV down the years. 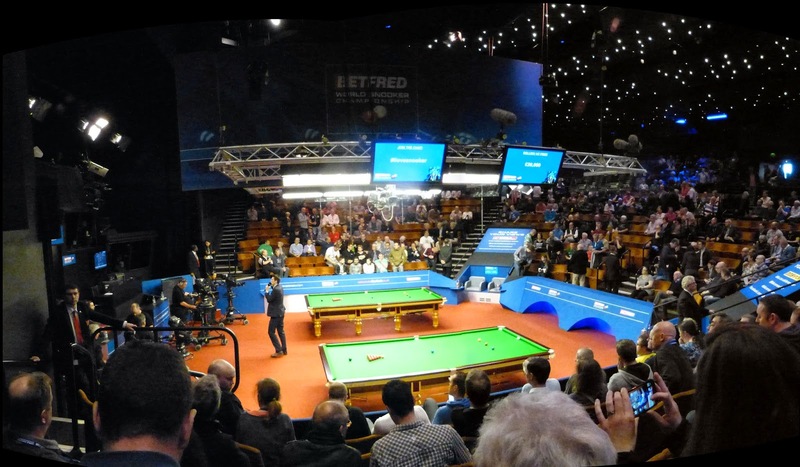 There were breaks of 141, 108, 104 and 90 in the opening four frames as the players traded frames to reach 12-12, before a miss on a long red by Robertson allowed Hawkins to build a break of 61 to win the tie. I have to say I found Hawkins’ celebratory fist-pump whilst the match was still going on (although the frame was effectively won) to lack a bit of decorum, and it probably contributed to Robertson’s storming from the arena with a face like fizz as soon as the perfunctory handshakes had been completed. At a Q&A Session in a nearby pub. All of the pre-Crucible era winners have been airbrushed out of history it appears. 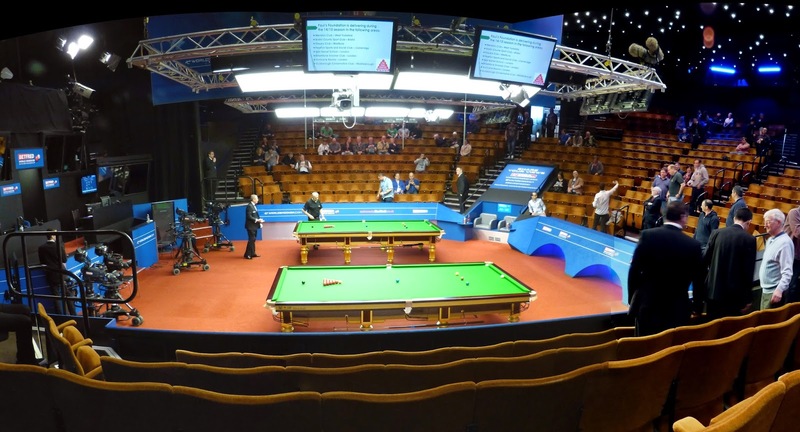 In the event Hawkins, perhaps a touch fatigued by his epic battle with Robertson succumbed rather tamely to Shaun Murphy in his semi-final tie. Murphy himself losing in the final to Stuart Bingham by 18-15.